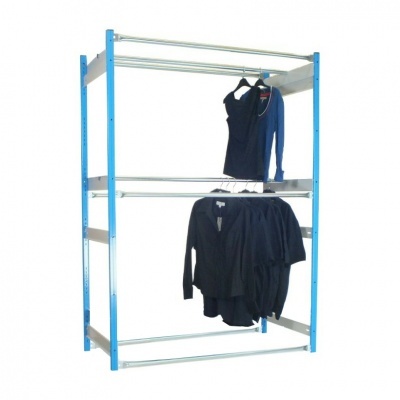 High quality garment racking unit with 2 inboard hanging rails. Each bay is made from commercial grade Trimline components and are commonly used in retail stockrooms by many of the leading retailers and fashion brands. The rails can be adjusted in height to create hanging spaces that perfectly suit your goods. Choose a starter bay if you just want a single standalone rack or use cost-effective add-ons to create long runs of connected garment racking. The inboard configuration of this unit retains the clothing within the rack - therefore minimising the overhang of garments into the aisle. Outboard rails are also included to complete the framework of the unit, these can be used for extra storage if required. Note: If you are unable to fix this unit to the wall/floor please call us before ordering.